San Antonio Podiatrist Walter Strash offers a variety of foot, ankle and podiatry procedures and treatments ranging from bunions to hammertoes to complicated foot surgeries. Retained foreign bodies are very common injuries of the foot. In the body, over 50 percent of foreign body injuries occur in the foot. The most common retained foreign bodies of the foot include needles, glass, wood, metal, plastic, stone and shoe soles/socks (from a puncture wound). Due to the complications of retained foreign bodies, one should have them surgically removed. Your foot and ankle specialist will take x-rays in the office to determine the depth and location of the retained foreign body. 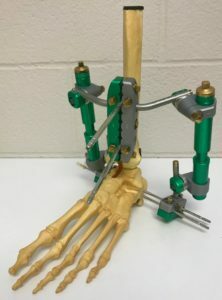 In the operating room your podiatrist will use a C-Arm (x-rays) to triangulate and locate the retained foreign body which will aid with incision placement and minimize trauma to the surrounding tissues. Retained foreign bodies can cause many types of complications in the foot and they should be removed. Potential complications of retained foreign bodies in the foot include migration, infection, joint stiffness (if within a joint), granuloma formation and chronic pain. 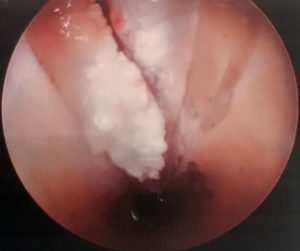 Infection is the most common complication of a retained foreign body and wood foreign bodies carry the highest risk of infection and inflammation. If you’ve stepped on an object or think that you have, visit your foot and ankle surgeon to be evaluated. What causes bunions? This question is often answered by blaming shoes. But in fact, shoes only play a small role in developing bunions. Yes, shoes, especially high heels cause abnormal squeezing of your forefoot. This in turn to help promote a bunion. But if everyone who wore high heels shoes had a bunion, there would be a lot more then the 15% prevalence we see in the general population. As you can see from the flow chart, genetics plays the major role in development of bunion deformities. Genetics determines the way your foot functions. Are you flatfooted? Are your joints flexible or stiff? Do you have a high arch? Do you have tight muscles? These traits are determined by your genetic code. These characteristics then govern how your bones and joints move when you walk. As an example, if your joints are very flexible, this can cause an abnormal amount of instability in your forefoot when you walk. Over time, this abnormal motion will cause the a bunion to develop by allowing your first metatarsal to “drift” towards the mid-line of your body. The fundamental driving force behind developing bunions as a result of faulty foot mechanics is genetics. Issues such as loose ligaments and flat feet, are inherited. The traits then act as the foundation for abnormal foot mechanics and lead to formation of bunions. The most common symptoms associated with this condition are pain on the side of the foot just behind the great toe. A red painful bump is usually present. Pain is usually brought on with walking or sports. Shoes don’t cause bunions but will typically aggravate them. Stiff leather shoes or shoes with a tapered toe box are the prime offenders. This is why bunion pain is most common in women whose shoes have a pointed toe box. The bunion site will often be slightly swollen and red from the constant rubbing and irritation of a shoe. Occasionally, corns can develop between the 1st and 2nd toe from the pressure the toes rubbing against each other. Stiffness and pain of the big toe joint is termed Hallux Rigidus or Hallux Limitus. Hallux is the medical term for the big toe and the terms rigidus and limitus describe the extent to which the toe can move. Many studies have been conducted trying to determine the exact cause of hallux limitus. Theories include, trauma, genetics, poor shoes, elongated metatarsal and biomechanical abnormalities. 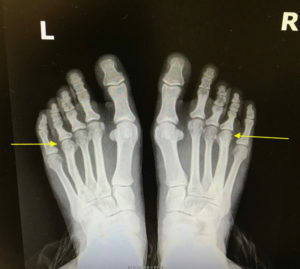 Abnormal alignment of the metatarsal bone relative to the proximal phalanx (big toe bone) is the most common biomechanical factor in developing Hallux Limitus/Rigidus. During a normal stride, whether walking or running, the proximal phalanx must most up and over the metatarsal. In order to do this, the metatarsal bone must be slightly lower then the proximal phalanx. 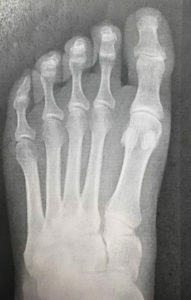 If the metatarsal bone is slightly elevated (or higher) then the proximal phalanx, the big toe cannot move up and over the metatarsal. Instead, a jamming of the joint occurs. 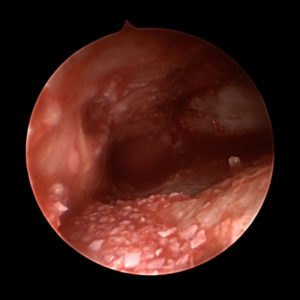 Repeated jamming over a period of years leads to degeneration of the joint. Cartilage is worn away and large bone spurs form on the top of the joint. The combination of cartilage loss and bone spurring causes loss of motion of the joint. Hammertoes are one of the most common podiatric foot problems. A hammertoe is a curling of toe the joints, sometimes affecting one or both joints of the toe. This curling of the toes often leads to rubbing on shoe gear. This abnormal rubbing leads to painful and unsightly toes. Calluses and corns soon follow. Despite popular belief, curling of your toes is not due to poor choices of shoe gear. Rather, biomechanical factors are usually to blame. Biomechanics is the term podiatrist use to describe how the foot and ankle move when you walk or stand. When we refer to someone as “flat footed” we are really describing is how biomechanics has affected their foot. Specifically, if the foot rolls in too much when you walk, we call that pronation. So a person who pronates has altered or abnormal biomechanics. When a person has normal biomechanics, there is an ordered motion to the muscles and joints of the feet and ankles. Altered, or abnormal biomechanics will lead to abnormal motion of the joints and muscles. Biomechanics then is used as a predictive model – telling us what happens to the foot in the presence of abnormal motions such as pronation. There are three distinct possible causes of hammertoes. Each is based on an abnormality in the biomechanics of the foot and ankle during the walking cycle. The flexors tendons are located on the bottom of the toe. These tendons should exert the same amount of force as their opposing tendons, the extensors tendons, which are located on the top of the toe. When the force generated by the contracture of the extensosr is equal to that of the flexors, the toe stays stablized during the walking cycle. In a person who is pronated or flat footed, the flexor tendons pull harder than the extensors, making the toe unstable during the walking cycle. Given enough time, this instability leads to a gradual curling of the toe. A hammertoe is born. This condition is essentially the opposite of flexor stabilization. 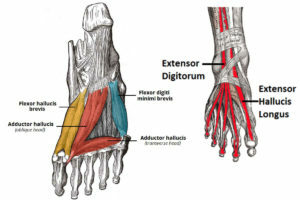 In this case, the extensor tendons over power the flexor tendons during the swing phase of the walking cycle(the foot swinging forward and off the ground). This leads to contracture of the toes. This phenomenon is commonly seen with people who have a very high arch. A weak calf muscle causes the flexor tendons of the foot to compensate, or carry more of the load. The flexor tendons overpower the extensors of the toe causing an unstable toe leading to curling. As we have seen, most causes of hammertoes are a result of podiatric biomechanical problems of the foot. 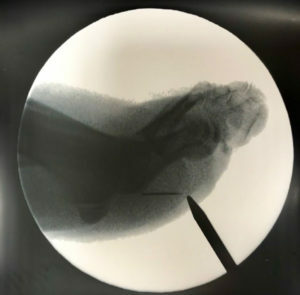 And while no conservative treatment can straighten the toes once curled, treatments aimed at correcting the underlying biomechanical abnormality can sometimes keep the toes from getting worse. The most effective biomechanical therapy are custom, podiatrist prescribed orthotics. These “arch supports” help to reestablish the normal force generated at the toe by the flexor and extensor tendons. Wearing shoes with larger toe boxed, preventing rubbing of the toes on the shoes. Wearing non-medicated padding over the boney prominence. Sanding the calluses on a regular basis. 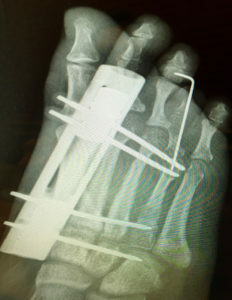 Surgical treatment consist of stabilizing the toe during the walking cycle. This is done a number of ways, depending the stiffness of the toe, presence of other deformities and overall health of the patient. 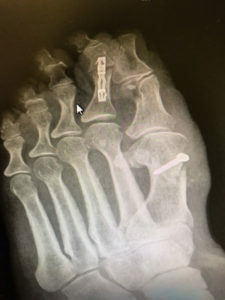 Recent advances in implant technology have led to the development of hammertoe specific devices to help maintain a straight toe following surgery. 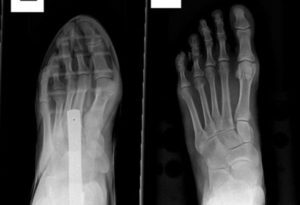 Recent advances in implant technology have led to hammertoe specific devices that aid in the fusion and straightening of hammertoes. Devices like the SuperScaffold™ Intramedullary Fixation Scaffold System by Metric Medical Devices, Inc. offers ease of application by the surgeon and increased success with fusion across the PIP joint. Traditional podiatric methods of stabilizing the toe following surgery are not without their own problem. 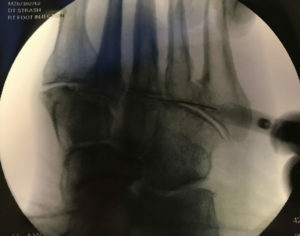 Typically, small smooth stainless steel wires known as “k-wires” are used to hold the toe straight during the first few weeks following surgery, after which time they are removed. However, they too suffer from possible complications including infection, loosening, and poor positioning. An intermetatarsal neuroma is any irritative process of the common digital nerve branch that supplies the plantar (bottom) of adjacent toes. It most commonly involves the nerve that supplies sensation to adjacent sides of the third and fourth toes, but can also affect other toes of the foot. A neuroma is not cancerous and is not a true tumor but a reactive, degenerative process such as a scar. Therefore, a neuroma is benign inflammation (enlargement) of the nerve. repetitive trauma from stresses incurred in occupational and recreational activities. Any condition that causes constriction or irritation to the nerve can lead to the development of a neuroma. As example, wearing shoes, especially dress shoes, causes significant squeezing of the forefoot. This, in turn, leads to compression of the nerves and eventually, a neuroma can form. Symptoms are aggravated by walking in shoes and relieved by removing shoes, massaging the foot, and rest. Continued pain at rest may suggest that the neuroma is worsening. The primary goal of podiatric treatment is to reduce or eliminate symptoms, so patients can maintain a normal lifestyle. Treatment may be surgical or non-surgical. Non-surgical treatment consists of treatments such as, steroid injections, sclerosing alcohol injections, changing shoe gear style, physical therapy and prescription orthosis. Injection therapy with 4% alcohol sclerosing agent has proven very successful in the treatment of intermetatarsal neuromas. A study from the November/December 1999 issue of The Journal of Foot & Ankle Surgery quoted an 89% success rate with the use of 4% alcohol sclerosing solution. Similar results in our podiatric practice has decreased the number of neuroma surgeries being performed. The decision to surgically intervene is based upon the patients symptoms, the judgment of your podiatric surgeon and your preference. A neurectomy or surgical excision of a neuroma is performed when conservative treatment proves ineffective. A stress fracture is one type of incomplete fracture in bones. It is caused by unusual or repeated stress.” This is in contrast to other types of fractures, which are usually characterized by a solitary, severe impact. It could be described as a very small sliver or crack in the bone; this is why it is sometimes dubbed “hairline fracture”. It typically occurs in weight-bearing bones, such as the metatarsals(bones of the foot). It is a common sports injury, and most cases are associated with athletics. Bones are constantly attempting to remodel and repair themselves, especially during a sport where extraordinary stress is applied to the bone. Over time, if enough stress is placed on the bone that it exhausts the capacity of the bone to remodel, a weakened site—a stress fracture—on the bone may appear. 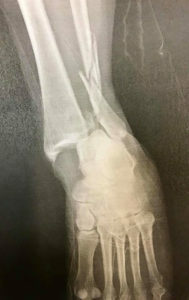 The fracture does not appear suddenly. It occurs from repeated traumas, none of which is sufficient to cause a sudden break, but which, when added together, overwhelm the osteoblasts that remodel the bone. Stress fractures commonly occur in sedentary people who suddenly undertake a burst of exercise (whose bones are not used to the task). They may also occur in Olympic-class athletes who do extraordinary quantities of high-impact exercise, in professional and amateur distance runners who run high weekly mileage, or in soldiers who march long distances. Muscle fatigue can also play a role in the occurrence of stress fractures. Consider a human runner. With each stride, large forces are exerted at various places in the legs. Each shock—a rapid acceleration and energy transfer—must be absorbed. Both muscles and bones serve as shock absorber. However, the muscles, usually those in the lower leg, become fatigued after running a long distance and lose their ability to absorb shock. As the bones now experience larger stresses, this increases the risk of fracture. Previous stress fractures have been identified as a risk factor. As with most conditions, a stress fracture is diagnosed with a podiatric history and physical exam. X-rays may not show any evidence of stress fractures, so a CT scan, MRI, or bone scan may be more effective in unclear cases. If a stress fracture occurs in a weight-bearing bone, healing will be delayed or prevented by continuing to put weight on that limb. Rest is the only option for complete healing of a stress fracture. The amount of recovery time varies greatly depending upon the location, severity, the strength of the body’s healing response and an individual’s nutritional intake. 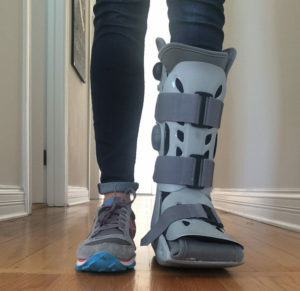 Complete rest and a cast or walking boot are usually used for a period of four to eight weeks, although periods of rest of twelve to sixteen weeks is not uncommon for more severe stress fractures. After this period activities may be gradually resumed, as long as the activities do not cause pain. While the bone may feel healed and not hurt during daily activity, the process of bone remodeling may take place for many months after the injury feels healed, and incidences of re-fracturing the bone is still at significant risk. Activities such as running or sports that place additional stress on the bone should only gradually be resumed. One general rule is to not increase the volume of training by more than 10 percent from one week to the next. Rehabilitation usually includes muscle strength training to help dissipate the forces transmitted to the bones. Bracing or casting the limb with a hard plastic boot or air cast may also prove beneficial by taking some stress off the stress fracture. An air cast has preinflated cells that put light pressure on the bone, which promotes healing by increasing blood flow to the area. This also reduces pain because of the pressure applied to the bone. If the stress fracture of the leg or foot is severe enough, crutches can help by removing stress from the bone. Typical style boot needed for treatment of stress fractures of the foot and ankle. With severe stress fractures, podiatric surgery may be needed for proper healing. 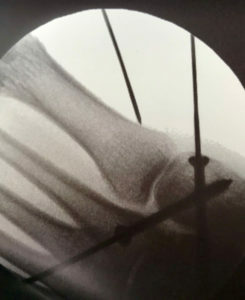 The procedure may involve pinning the fracture site, and rehabilitation can take up to a half year. Metatarsal are the bones in the mid-foot portion of your foot, just behind the toes. They are responsible for giving your foot its overall shape. They are also the most commonly broken foot bone. There are five metatarsals, and they are numbers from left to right 1 through 5. The outside metatarsal, also known as the fifth metatarsal, is the most frequently fractured (broken) foot bone. 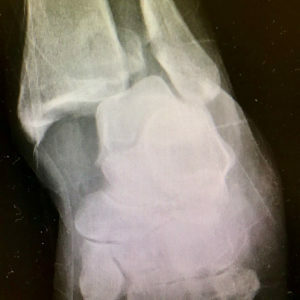 Because of its unique position on the outside of the foot, relatively minor twists can result in a fracture. 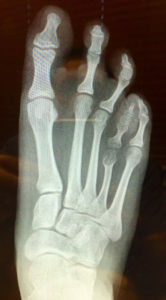 Stress fractures of the fifth metatarsal are also a common occurrence, however, less so then other areas of the foot. The anatomy of the fifth metatarsal also contributes to frequent injuries. At its base, a large tendon, the peroneus brevis provides a strong pull to the base of the bone. The bone then narrows, forming a long slender cylinder. Injury occurs with a sudden twist of the foot. Generally, a snap or popping sensation is felt. This is followed by swelling and bruising. Usually, there is pain with walking. There are distinct zones of injury. Tuberosity fracture: These fractures are the most common and result from the peroneus brevis forcefully pulling the base of the bone. Base fractures are usually treated with immobilization and crutches. If the broken bone has shifted, surgery will be needed to restore proper anatomy. Jones Fractures: Jones fractures occur in a small section of the bone where there is a poor blood supply feeding the bone. Any injuries that occur in this “zone” are prone to complications. Jones fractures are treated both with non-weight bearing casts and surgery. They can develop a non-union (a broken bone which has given up trying to heal) if not treated by a qualified podiatrist. These fractures are common in athletes as they general require high energy movements. Mid-shaft fractures: These fractures occur by twisting the forefoot. Walking off a curb and twisting your foot is a very common way to sustain this type of injury. A definite snap is felt and sometimes heard. The foot quickly becomes swollen and bruised. Treatment usually requires surgery, depending on the amount of damage. If the bone has not shifted too much, a cast boot can be applied. 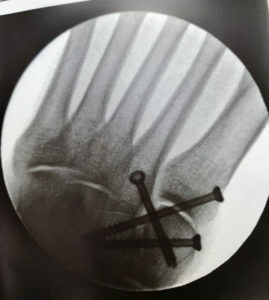 However, if there is moderate movement of the broken bones at the time of injury, a plate and screws will be required to restore normal anatomy. Gout is a type of arthritis (inflammation of the joints) that mostly affects men age 40 and older. It is caused by chronic hyperuricemia–a long-lasting, abnormally high concentration of uric acid in the blood. Purines, nitrogen-containing compounds, are the chemical sources of uric acid and can be divided into two types, endogenous and exogenous. Endogenous purines are synthesized within the nuclei of cells in the human body itself, whereas the exogenous purines are obtained from foods. Uric acid is the end product of purine metabolism and is mostly produced in the liver. From there it enters the bloodstream. Most of uric acid eventually passes through the kidneys and is excreted in the urine; the rest is disposed of in the intestines, where it is processed and oxidized by bacteria. Normally these processes keep the concentration of uric acid in the blood plasma (the liquid part of the blood) below 7 milligrams per deciliter (7 mg/dL). Under certain circumstances, however, the body produces too much uric acid or excretes too little, resulting in levels above 7 mg/dL–the point at which hyperuricemia develops. In the bloodstream, uric acid exists predominantly as a dissolved salt called monosodium urate (MSU). At 37 degrees C (normal body temperature) and at a uric acid concentration approaching 7 mg/dL, the blood plasma becomes supersaturated, and needlelike crystals of MSU form. Crystallization is governed by other factors as well. In joints, such as the knee and ankle, temperatures are cooler (29 degrees C to 32 degrees C), and MSU crystals are able to form at even lower uric acid concentrations, which explains why gout favors these joints. In time, MSU crystals can provoke an inflammatory response that produces the symptoms characteristic of gout. In respect to gout, humans are less fortunate than many animals, which never suffer from gout because they possess uricase, an enzyme that converts uric acid to allantoin, a substance much more easily excreted by the kidneys. Gout is classified as either primary (the most common type) or secondary, depending on the cause of the associated hyperuricemia. In both types of gout, between 70% to 95% of hyperuricemia cases are the result of underexcretion of uric acid, rather than uric acid overproduction. Hyperuricemia in primary gout arises or is presumed to arise from a genetic or other inborn disorders that cause metabolic problem resulting in overproduction of uric acid or reduced excretion of uric acid. More than 99% of primary gout cases, however, are idiopathic, meaning that the cause of the hyperuricemia cannot be determined. The remaining cases are traceable to either of two rare inherited enzyme defects that affect purine synthesis in the cells. In secondary gout, hyperuricemia is caused by drug therapy or by medical conditions other than an inborn metabolic disorder. Medications. Thiazide diuretics (the “water pills” used to control hypertension) cause hyperuricemia by decreasing uric acid excretion. The list of drugs that cause hyperuricemia is long and includes not only diuretics but also pyrazinamide (used to treat tuberculosis) and the immunosuppressive drug cyclosporine (given to transplant recipients to prevent organ rejection). Low doses of aspirin and other salicylates decrease uric acid excretion, whereas high doses have the opposite effect. Kidney Disorders. Renal (meaning kidney) insufficiency is the impaired ability of the kidneys to eliminate waste products, including uric acid, which then build up in the blood. Gout is associated with three primary disorders that can cause renal insufficiency: urate nephropathy; uric acid nephropathy; and uric acid nephrolithiasis. Urate nephropathy occurs when monosodium urate crystals form in kidney tissue is uncommon and researchers believe that it usually causes only minor kidney damage. Uric acid nephropathy is a disorder that occurs uric acid crystals from urine forming in the structures and tubes that carry fluid from the kidney. It most often occurs during chemotherapy for lymphoma or leukemia. It can result in kidney failure by obstructing urine flow, but is preventable and reversible. Uric acid nephrolithiasis occurs when kidney stones form from uric acid. Uric acid and other kidney stones are present in 10% to 25% of patients with primary gout–a prevalence more than 1000 times that in the general population. In secondary gout, the reported incidence reaches 42%. Uric acid stones can also form in the absence of gout or hyperuricemia. Not all of the kidney stones in patients with gout are composed of uric acid; some are composed of calcium oxalate, calcium phosphate, or those substances combined with uric acid. Kidney stones can be extraordinarily painful and can cause infection and kidney failure if untreated. Other Medical Conditions. A number of diseases, including leukemia, lymphoma, and psoriasis, can cause gout. Over exposure to lead can cause gout. Alcohol Use. Alcohol use increases uric acid levels in three ways: by providing an additional dietary source of purines (the compounds from which uric acid is formed); by intensifying the body’s production of uric acid; and by interfering with the kidneys’ ability to excrete uric acid. Gout is often divided by experts into four symptomatic stages: asymptomatic hyperuricemia, acute gouty arthritis, intercritical gout, and chronic tophaceous gout. Gout symptoms can be precipitated by stress, infection, joint injury, weight loss, surgery, certain kinds of drug treatment, overindulgence in alcohol or purine-rich foods, or even something as seemingly inconsequential as a long walk that one was not sufficiently physically fit to undertake. Asymptomatic hyperuricemia always precedes gout and is considered the first stage of the disorder. It can last, however, for an average of 30 years. Hyperuricemia also does not inevitably lead to gout. In fact, less than 20% of the hyperuricemic population develops this arthritic disease. Acute gouty arthritis is the stage at which the first symptoms of gout appear. Sometimes gout is heralded by brief twinges of pain (petit attacks) in an affected joint, which can precede the actual full-blown condition by several years. Symptoms usually begin as a sudden, severe, and unexpected arthritic attack affecting a single joint in one of the lower limbs, a condition known as monoarticular gout. 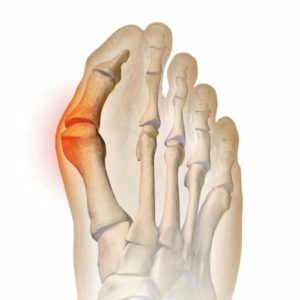 The joint of the big toe is the site of about half of all first gout attacks–a specific condition called podagra. The site is often medically referred to as the big toe’s metatarsophalangeal (MTP) joint–the point where one of the long five bones of the foot meets the first digit of a toe. The joints of the foot, ankle, knee, wrist, elbow, and hand are other frequently affected sites. In such cases the condition is known as polyarticular gout. More than one joint is affected in 10% to 20% of first attacks. The pain usually occurs in joints on one side of the body and it usually, although not alway in the lower extremities. People with polyarticular gout are more likely to have a more gradual onset of pain and a longer delay between attacks. They also more likely to experience a low-grade fever, loss of appetite, and a general feeling of unwellness. The primary symptom, which usually takes eight to 12 hours to develop, is severe, sometimes crushing pain at and around the joint. In many cases the attack occurs late at night or early in the morning and announces itself by waking the sufferer. Some patients describe it as resembling a disoclated bone and one writer described it as “like walking on my eyeballs”. Chills and mild fever may follow. The area can be so tender that walking and even the weight of bedsheets can be unbearable. Swelling may extend beyond the joint, indicating fluid build-up within. The skin over the affected area is often red, shiny, and tense. After a few days it may start to peel. An untreated attack will typically peak 24 to 48 hours after the initial appearance of symptoms, and subside after five to seven days, although it can last only hours to several weeks. Intercritical gout is the term used to describe the periods between attacks. The first attack is usually followed by a complete remission of symptoms, but in untreated cases most people can expect a recurrence. One study found that 62% of subjects experienced at least one further attack within a year. At the end of two years 78% and after 10 years 93% of patients experienced a recurrence of gout. When gout remains untreated, the intercritical periods typically become shorter and shorter, and the attacks–although sometimes less intense–can last longer. Gout may also eventually affect several joints, including those that may have been free of symptoms at the first appearance of the disorder. In rare cases, the shoulders, hips, or spine are affected. Over the long term–about 10 to 20 years–in untreated gout the intercritical periods dwindle until gout becomes a chronic disorder characterized by constant low-grade pain and mild or acute inflammation in several joints. Persistent gout, moreover, can destroy cartilage and bone, causing irreversible joint deformities and loss of motion. Tophi. After several years, persistent gout can produce tophi, which are solid deposits of MSU crystals that form in the joints and elsewhere in the body (hence the term chronic tophaceous gout). Without anti-hyperuricemia treatment, tophi develop on average about 10 years after the onset of the disease although their first appearance can range from three to 42 years. Bones, cartilage, tendons, soft tissue, and membranes containing synovial fluid (the lubricating fluid surrounding joints) can all harbor tophi. Common locations include the helix of the outer ear (the curved ridge along the edge of the ear), the fingers, hands, forearms, knees, and feet, and the olecranon bursa (a sac at the elbow joint filled with synovial fluid). In some cases, tophi break through the skin and appear as white or yellowish-white chalky nodules. (They have been described as looking like “crabs eyes.”) Although tophi themselves are generally painless, they often cause pain and stiffness in an affected joint and can erode cartilage and bone, ultimately destroying the joint. Large tophi under the skin of the hands and feet can give rise to extreme deformities. In rare cases, they can settle in regions around the heart and spine. Today, drug therapy has reduced the prevalence of chronic tophaceous gout to as little as 3%, although certain groups, such as transplant patients receiving cyclosporine, still face a high risk of developing tophi. In the past, gout often developed into a painful and disabling chronic disorder. Tophi could destroy bone and cartilage in the joints, similar to rheumatoid arthritis. But now, after several decades of research into the causes of gout and the development of drugs for controlling hyperuricemia, gout rarely poses a long-term threat to health if properly treated. Still, it remains a source of short-term pain and incapacity for thousands of Americans. Although gout itself is not life-threatening, it is often associated with serious diseases. Diabetes and obesity are very common in gout patients as well as high blood pressure and kidney disease. Kidney disease, in fact, is more common in gout patients than in people with diabetes. (Gout, however, is more likely to be caused by kidney problems than is hyperuricemia the cause of kidney abnormalities.) Kidney stones are also common in people with gout and occur in between 10% and 40% of patients. Usually the stones are composed of uric acid but they may also be formed from other materials. Gout is one of the most common types of arthritis. In the United States there were an estimated 2.2 million cases of self-reported gout in 1986, and a 1991 publication noted that Americans lost an estimated 37 million working days a year to gout. It is estimated that approximately 15 of every 1,000 American males between 35 and 45 years of age have gout and some experts believe that one in 100 men may be at risk for it. It is very uncommon in less developed countries and in 1952 it was said to be unkown in China, Japan, the tropics, and rare among African Americans. The prevalence of gout not only in America but in other developed countries has, however, been rising in recent decades, possibly because of dietary and lifestyle changes, greater use of medications that cause hyperuricemia, and aging populations. Gout typically strikes only after 20 to 40 years of persistent hyperuricemia and men tend to have higher uric acid levels than women. For these reasons, men over 40 years old account for about 90% of the population affected by gout. Among children, the levels of uric acid are the same for both genders (an average of 3 to 4 milligrams (mg) of uric acid per deciliter (dL) of plasma. Male levels rise substantially at puberty, with the result that the level exceeds 7 mg/dL (considered to indicate hyperuricemia and an increased risk for gout) in about 5% to 8% of American men. For many men, hyperuricemia begins in puberty and may last a lifetime. Less than 5% of patients with gout are female. The female hormone estrogen appears to facilitates uric acid excretion by the kidneys (the body’s chief mechanism for disposing of uric acid), so levels in women remain essentially stable until menopause, after which they approach male levels. Premenopausal women are thus much less likely than men of the same age to be hyperuricemic, and whereas men usually experience their first attack of gout between the ages of 30 and 50 years old, women are more likely to experience gout between the ages of 50 and 70. Rare inherited genetic disorders that cause hyperuricemia can result in gout in children. A fairly substantial proportion of patients with gout (10% to 20%) have a family history of gout, but it is not known if genetics, environmental factors, or both play roles in this association. Risk factors are attributes or activities associated with a greater-than-normal likelihood of developing a particular disorder (as in the case of obesity and heart disease, or smoking and lung cancer). Sometimes a causal connection between the attribute or activity and the disorder can be established, but at other times there is simply a statistical correlation. The risk factors for gout, of which there are several, are identical to those for hyperuricemia. Obesity. Researchers report a clear link between body weight and uric acid levels and have also discovered that obesity is an especially important risk factor in men. Hypertension. Hypertension (high blood pressure) is found in 25% to 50% of patients with gout, but whether it causes hyperuricemia is uncertain. Alcohol use. Alcohol use is associated with gout and in one study, it was the only notable risk factor for women with gout. Standard diagnostic tools for gout may include a medical history and physical examination, a blood test for hyperuricemia, and urine sample. For a definitive diagnosis of gout, a sample of synovial fluid from the affected joint is required. X-rays can provide helpful information in some cases. As part of the diagnostic process other disorders that resemble gout symptoms or cause hyperuricemia should be ruled out. Some experts believe both gout and pseudogout are underdiagnosed in hospital patients resulting in incorrect therapy–for example antibiotics for cellulitis, a serious infection that has symptoms similar to those of gout. Pseudogout. Pseudogout is a condition most likely to be confused with gout. It is caused by deposits of calcium pyrophosphate dihydrate crystals in and around the joints. Though pseudogout resembles gout in some ways, the first attack typically strikes the knee rather than the joint of the big toe, and at least two-thirds of cases affects more than one joint. The symptoms of pseudogout also appear more slowly than those of gout, taking days rather than hours to develop. Other Causes of Arthritic Pain. 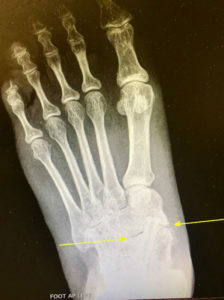 The symptoms of gout can resemble those of many other disorders, including acute rheumatic fever, rheumatoid arthritis, traumatic arthritis, osteoarthritis, serious skin infections, hallux rigidus (painful stiffness in the first joint of the big toe), and Reiter’s syndrome (a disorder characterized by arthritis, urethritis, and conjunctivitis). Many of these disorders can be present at the same time as gout. Other Causes of Hyperuricemia. Binge drinking, fasting, lead toxicity, leukemia, certain uncommon anemias, multiple myeloma, and lymphomas are also uncommon causes of high uric acid concentrations. Determining which joints are affected in a patient suspected of having gout is an obvious first step in any diagnosis. A podiatrist is more likely to suspect gout as the cause of an acute attach of arthritis if it first appears in the first joint of the big toe than it if arthritis attacked, for example, a shoulder or hip. The examiner also needs to determine whether the onset of pain and swelling was rapid, for symptoms that require days or weeks rather than hours to develop probably indicate a disorder other than gout. Another possible indicator of gout is previous damage to an affected joint, because gout often arises in injured joints. A blood test is usually given, although some podiatrist argue that it isn’t necessary, given what is now known about the variability of uric acid levels in people with gout. Uric acid levels in the blood during an attack of gout do not necessarily mirror levels before the attack, and in fact can lie within or below the normal range. Even if hyperuricemia is present, it is very common in the population and does not necessarily indicate the presence of gout. A low level of uric acid in the blood however, makes a diagnosis of gout much less probable, and a very high level increases the likelihood of gout. It is sometimes helpful to gauge the amount of uric acid excreted by the patient over the course of 24 hours, particularly if the patient is young and has pronounced hyperuricemia that might be related to a metabolic disorder. If the amount exceeds a particular value, further tests for an enzyme defect or other identifiable cause of gout arising from uric acid overproduction are justified. Greater-than-normal amounts of uric acid in the urine also indicate that the patient faces a greater risk of developing uric acid kidney stones, and can guide the physician in his or her choice of drug therapy for chronic gout. The urine is collected during an intercritical period, after the patient has been placed on a purine-reduced diet. The patient is also asked to temporarily stop using alcohol and any medications that can interfere with the test. On the first day of the test, the urine passed by the patient on waking up in the morning is discarded, but for the next 24 hours the patient collects all of his or her urine in a special container. The test concludes the next morning with the patient urinating into the container right after waking up. The container is then delivered to the patient’s podiatrist or sent directly to the laboratory. The synovial fluid is the lubricating liquid that fills the synovium, the membrane that surrounds a joint and creates a protective sac. In addition to cushioning joints, this fluid supplies nutrients and oxygen to cartilage, the slippery tissue that coats the ends of bones. The procedure for taking a sample of synovial fluid from an affected joint is called aspiration. A needle attached to a syringe is inserted into the joint and suction is used to draw the fluid into the syringe. Local anesthesia is avoided because it can reduce the effectiveness of aspiration, but normally the procedure is only mildly uncomfortable. Following the procedure there can be some minor discomfort in the area where the needle was inserted, but it usually dissipates quickly. Aspiration can cause infection, though this occurs in less than 0.1% of patients. After the sample is taken, it is sent to a laboratory, where a microscope is used to look for monosodium urate (MSU) crystals, which can be detected with polarized light. The laboratory can also test the sample for infection (always a possibility in cases of gout). Another benefit of podiatric aspiration is that it sometimes eases a patient’s symptoms by reducing swelling and pressure on the tissue surrounding the joint. For the most part, x-rays do not reveal any abnormalities during the early stages of gout, and their usefulness where gout is concerned lies in assessing the progress of the disorder in its chronic phase and in identifying other health problems whose symptoms may resemble those of gout. Tophi can be seen on x-rays before they become apparent on physical examination. Foot ulcers (sores) and infections are a problem that can be caused by diabetes. The severity of the problem can range from minor sores to serious damage of tissues in the foot. When you have diabetes, the circulation of blood to your feet is not as good as it should be. It is harder for the body to fight infections and heal itself. As a result, any infections and sores on your feet can become serious. Without treatment, severe infections can cause the flesh of your foot to die (gangrene). Diabetics are 20 times more likely to have gangrene in the foot than people who do not have diabetes. Because diabetes damages nerve endings, you may not feel pain if you hurt your foot or get an infection. This can make it difficult for you to know that you need medical treatment. The initial podiatric symptoms are swelling, redness, or pain. Sores may appear on the sole of your foot. They may heal but later return in the same place. If the sores are not treated, that part of the flesh of your foot may die and turn black. You may need antibiotics or other medications to put on the sore or infected part of your foot. The medicine will help fight infection, rid the wound of dead flesh, and help new, healthy flesh to grow. You may have to stay off your feet for a while to prevent further irritation of the sores or infections. You may be hospitalized for treatment. If antibiotics don’t heal the infected or ulcerated area, the podiatrist may have to remove the infected flesh surgically. If you have gangrene, the doctor may have to amputate part or all of your foot. How can I help prevent diabetic foot complications? Check your feet every day and follow the Podiatrists foot care guidelines given below. Look at your feet with a mirror at the end of each day to make sure you have no reddened areas, cuts, or scrapes that could become infected. Wash your feet every day with soap and warm (not hot) water. Then dry your feet carefully, especially between the toes. Apply lanolin after your feet are dry to keep the skin soft and free of scales. If your feet sweat a lot, keep them dry by dusting them with talcum powder. Don’t treat corns or calluses yourself. Do not use over- the-counter products for these problems unless your health care provider says it is OK.
Tell your health care provider right away if you develop a corn or callus. Cut your toenails carefully. Cut them straight across. Do not cut the sides or the cuticles. If your nails are hard to trim, ask your podiatrists office for help. Wear cotton socks to bed if you need extra warmth for your feet. Avoid using hot water bottles or electric heaters to warm your feet. Because you may not fully sense hot and cold with your feet, you may burn your feet accidentally and develop an infection. Avoid putting your feet where they could accidentally be burned; for example, on hot sand at the beach, in hot bath water or whirlpools, or near a fireplace. Wear soft leather shoes that fit properly and have the seal of approval of the American Podiatric Medical Association. Ask your health care provider about specially made shoes, especially if you have foot problems. Avoid wearing new shoes for more than an hour a day until they are thoroughly broken in. Wear clean socks and change them at least once a day. In addition to these foot care guidelines, good control of your blood sugar and your blood pressure help prevent foot problems. San Antonio has one of the highest incidence of diabetes and obsesity in the country. Podiatrists in San Antonio are all to familiar with the common presentation of Charcot foot to their office. Fungi which causes infection of our feet is everywhere in the environment. We all have fungus living on our feet and in our shoes, but not all of us get fungal infections. Areas which have high concentrations of fungus include damp areas such as public gyms, shower stalls and swimming pools. Athletes and people who wear tight-fitting shoes or tight hosiery that cause trauma to the toes or keep the feet from drying out are at higher risk. The condition can also spread from one toe to another, or to other parts of the body. Other risk factors include abnormal PH level of the skin, not drying off the feet thoroughly after bathing or exercise, and a compromised immune system in someone who has been exposed to a fungus. Diabetics have an increased risk of contracting a toenail fungus because their immune system is compromised. San Antonio as with other sub tropical areas, tend to have higher rates of fungus then colder cities. Podiatrist are typically the first specialist to diagnose and treat this condition. Thick, yellow toenails are due to nail fungus approximately 60% of the time. Other causes include nail root damage, metabolic disease, psoriasis and eczema. Toenail fungus, also known as onychomycosis, affects millions of people world wide, and is most prevalent in warm climates. Fungi, which are microscopic organisms, typically thrive in warm, moist environments. A function of modern day society is the use of shoe gear. This also happens to be the perfect happy home for fungus. As a result, the incidence of nail fungus is much higher on the toes then on the hands. Signs that you may have toenail fungus include thick, yellow toenails. You may also see redness and scaling to the bottom of your feet. This is known as a chronic athlete’s foot infection and is a result of infected toenails acting as a reservoir, constantly infecting your skin. Toenail color can vary from brown or yellow to white with this condition. It occurs most often on the big toe, but can easily spread throughout all of your toes. Because it is difficult to treat or eradicate toenail fungus, it is a good idea to try to prevent it. It helps to wear protective shoes or sandals in public showers, pool areas and gyms, and to avoid borrowing someone elses shoes or sharing socks or towels with someone who has toenail fungus. An orthotic device can be used to add cushioning and/or control over-pronation, support the longitudinal arch, and reduce stress on the lower leg muscles. If you do develop toenail fungus, see your foot doctor. 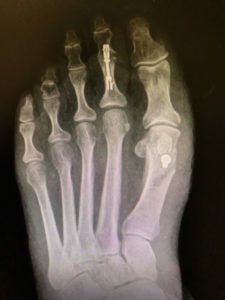 The podiatrist might remove as much of the nail as possible by trimming, filing or dissolving it. Medicated nail polish might be prescribed for a localized infection, but a serious infection will likely be treated with a prescription oral antifungal medication. These medications can have side effects, so be sure to work closely with your podiatrist on your treatment plan. Only in severe cases will surgical removal of the nail be recommended. If you suspect that you have toenail fungus, see your podiatrist. Ingrown toenails are a common podiatric ailment in nearly all ages. The inner or outer side of a toenail can cause pressure on the skin. If the pressure is great enough an infection can result. The most common cause of ingrown toenails is improper cutting of the nail. Cutting the nails too short allow the soft tissue on the tip of the toe to wrap around the nail. As the nail continues to grow it pushes on the skin causing pain and infection. Other causes include trauma, shoe or sock pressure and diseases of the nail that cause thickness. Bathroom surgery is not recommended as it is commonly painful and unsuccessful in resolving the problem. A simple in office minor podiatric procedure is commonly performed to resolve the problem on a permanent basis. There are several complaints, as podiatrist in San Antonio, that we see over and over. Warts (foot warts, plantars wart, verrcua plantaris) are just such a problem. Warts are a non-cancerous growths of the skin. They are caused by the Human Papillomavirus (HPV) . HPV describes a broad category of viruses which cause various infection. We are concerned with a very small subset of the HPV family, specifically, HPV 1, 3, 27, 29 and 57 are known to cause warts on the foot. The HPV only infects the superficial structures of the skin, and thus does not invade any other body parts. 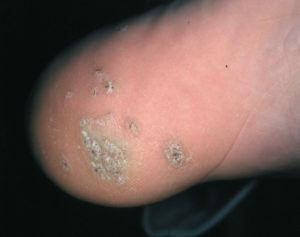 The warts typically occur on areas of the foot that are under direct pressure, such as the ball and heel of the foot. However, they can also be seen under and around toenails, as these structures tend to be under pressure from shoe gear. Warts infect the skin by penetrating microscopic cuts in its outer layers. The HPV virus can live for many months of moist surfaces. Hence, gyms, showers, sharing of shoes and other moist areas can harbor the virus. Once the virus enters the skin, symptoms will usually be noticed within several weeks. It is estimated that up to 12% of the world’s population and 20% of school aged children are infected with this type of HPV wart. Most people who are infected with the virus will have spontaneous resolution within 6 months. Breaks or cuts in the skin on the bottom of the foot. Typical appearance of a wart to the toe. Generally, patients complain of the painful growth of the bottom of their foot which often times looks like a callus. It is not usually, to see dark specs within the “callus.” These are often confused with a possible retained foreign material such as a thorn of a piece of glass. However, these spots are small blood vessels which feed the wart. We often look for these spots to help diagnosis the condition. Patient may also note bleeding from the wart when they pick or scratch at it. Despite this extensive and diverse list of possible treatment modalities, there is little consensus as to a gold standard treatment. This condition refers to an abnormally shortened metatarsal bone. This is generally caused by a premature closure of the growth plate of the metatarsal. While the remaining metatarsals continue to grow at a normal rate, the affected bone will remain the same size. With time, this causes a visible difference in the appearance of the toes around the time of early puberty. Most commonly, the fourth metatarsal is affected, resulting in a the appearance of a short forth toe. We owe a great deal of acknowledgment to the work done by the Russians regarding ground breaking work in the area of treating severe structural abnormalities utilizing a concept known as the the “tension stress effect.” This concept, developed by Dr. Ilizarov, focused on the bodies ability to “grow” new bone in a widening distraction gap under controlled mechanical means. Utilizing the these principles, it is possible to lengthen bones which are abnormally short and restore the appropriate length. 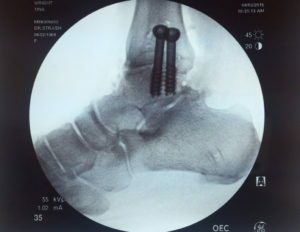 In the forefoot this technique can be applied both to congenitally short bones as well as shortening due to surgical complications. Proper communication between the podiatric surgeon and the patient is critical. The patient will play an active role in the surgical outcome and commitment to perform daily distraction is critical. Nicotine use has been shown to impede bone healing. Since this procedure involves a complex biological cascade of events with each step dependent on the preceding, smoking cessation is required. 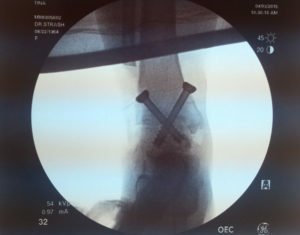 A mini external fixator is place over the bone to be lengthened. A small surgical cut in the bone is performed. After 7-14 days, the patient will turn a tiny wheel on the mini fixator twice a day. Turning the wheel will slowly move the bone. The gap that is created will fill in with newly grown bone. The number of days required to distract the bone is dependent on the amount of lengthening required. For example, if the metatarsal needs to be lengthened 20 mm, it will take 40 days of lengthening (based on 0.5 mm per day). Lisfranc injury is also known as Lisfranc fracture, Lisfranc dislocation, Lisfranc fracture dislocation, midfoot injury and foot sprain. This injury can be challenging to diagnose and is often missed diagnosis by the nonspecialist. Causes of Lisfranc fracture dislocation include stepping ina hole where the foot is rotated downward, falling from a horse with the foot remaining in the stirrup and direct crush injury to the foot. Patients will pain throughout the midfoot with circumferential swelling, pain throughout the midfoot with attempts at walking, bruising and possible blistering and abnormal widening of the foot. Your podiatrist with perform a history and physical along with an exam of the injured foot. 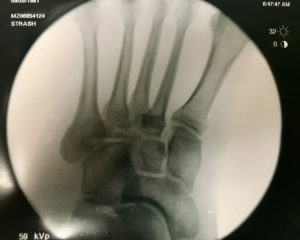 The doctor should always perform x-rays and it is very helpful to perform x-rays of the uninjured foot for comparative purposes to determine if there is widening (instability) at Lisfranc’s joint. Your foot and ankle specialist may also order additional studies such as an MRI of CT scan. Treatment may or may not involve surgery. If there is no fracture or dislocation in the joint and the ligaments are not torn, nonsurgical treatment is indicated in the form of casting and nonweightbearing for six weeks. Strict nonweightbearing with fracture boot/cast and crutches must be adhered to and this is followed by a gradual return to weightbearing using a brace prior to returning to full activities. 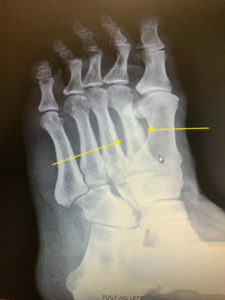 Surgery is indicated for Lisfranc fracture dislocation when a fracture in the joints of the midfoot are present or there is abnormal positioning (subluxation) of the joints. The goal of surgical correction is to realign the joints and return the fractured bones to a normal anatomical position. 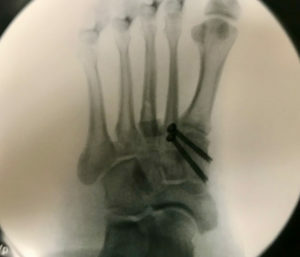 The surgery requires reducing the deformity in the operating room under x-ray and then placing screws (pictured here) or plates to maintain the corrected position. It is possible that some or all of the hardware may have to be removed at some point in the future. After surgery patients will be required to remain nonweightbearing in a fracture boot/cast for a period of six to eight weeks. This is followed by a gradual return to weightbearing using a brace and possible physical therapy. It is important to note that some athletes never return to their pre-injury level of sporting activity after Lisfranc fracture dislocation. Despite accurate and excellent surgical reduction with fixation it is possible for arthritis to develop in the injured joints resulting in chronic pain. This chronic pain to the joints may require further surgery in the form of fusion (arthrodesis) in the future. The most common reason patients seek podiatric care is for heel pain. This condition can be caused by a variety of factors. Including, entrapped nerves, metabolic disorders, arthritis and infections. By far the most common cause, accounting for 95% of all cases, is abnormal, repetitive stresses placed on the anatomic structures of the foot and leg resulting in injury and inflammation. This condition is known as plantar fasciitis. The plantar fascia has several functions. It helps keep the small muscles of the foot in a compact and efficient package beneath the foot when full weight is bore. More importantly, it helps maintain the bones of the foot in an “arch” orientation. As body weight is transmitted down through the leg and ankle, the foot tries to maintain a triangle shape. 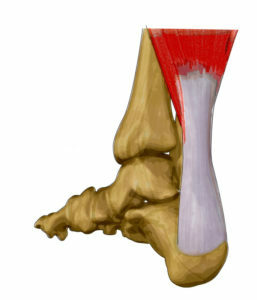 The base of the triangle is the plantar fascia. The fascia must resist the force of the heel and arch bones to flatten out. The extent to which the arch flattens is dependent on how much the plantar fascia can support. Thus, during the normal course of walking, our plantar fascia is subjected to tremendous, repetitive forces. To understand what is causing heel pain, an examination of the anatomy is necessary. The plantar fascia is a dense thin layer of tissue just beneath the skin on the sole of the foot. It is shaped like a triangle (blue lines), with the apex oriented towards the back of the foot. Since the plantar fascia is shaped like a triangle, a great deal of force is concentrated at the heel. When too much strain is placed on the fascia, the area of greatest strain becomes inflamed. This inflammatory process leads to pain and swelling. This is often termed plantar fasciitis or heel spur syndrome. Over time, this condition may produce bone projections off the heel known as spurs. Often times, patients will come to the podiatrist’s office with heel pain wishing their “spurs” be removed. They believe the heel pain is caused by these bony growths, when in fact, the true reason for the pain is from inflammation of their plantar fascia. The heel spur has developed in response to the chronic irritation of the plantar fascia on the calcaneus (heel bone). Patients present to the podiatrist’s office with chronic pain to the bottom of the heel. Usually, this pain has been present for weeks to months and they have delayed seeking treatment hoping the symptoms would subside. Terms such as a stone bruise or deep ache are usually used to describe the discomfort. The onset is usually gradual, with no recollection of an injury or accident. Classically, the pain is worse when arising from rest. For example, the first few steps taken after waking in the morning or after a prolonged period of sitting can generate the most pain. Once the foot warms up, the heel pain may lessen. Swelling or puffiness on the inside of the heel may also be noticed. For the vast majority of patients (90%), conservative treatment can eliminate their pain. But this does not happen overnight. Rare, are the cases where one visit to the Podiatrist can completely alleviate their symptoms. We tailor our treatment to the individual patient, taking into account health, lifestyle and their work environment. A cookie cutter approach will not be as effective, as there are many factors which must be considered. In general, the steps outlines below are utilized in different combinations and varying degrees of emphasis. Also known as NSAID’s, this class of drugs helps to decrease the inflammatory process which maybe occurring around the damaged plantar fascia. These medications should only be used for very short periods of time and the risks vs. the benefits must be weighed with each individual patient. Serious complications can occur using this class of medicine. By stretching, if by far the most important part in the resolution of this condition. Stretching instructions are to be performed on a daily basis. Skipping this step and relying on medications alone will not result in a long term resolution. Night splints are also an integral part in stretching the plantar fascia, Achilles tendon and calf muscle. Injection into the plantar fascia of a long acting steroid provides potent anti-inflammatory action. They are used for moderate to severe cases of plantar fasciitis. Plantar fasciitis which does not respond to other forms of treatment is also an indication for injection therapy. Although no stead fast rule exist as to the number of injections you can receive, be aware the multiple steroid injections into the same anatomical area can result in permanent tissue damage. These devices help to support the arch and take pressure off the plantar fascia. They are placed in shoe gear and can help prevent recurrence of the condition. Both, podiatrists prescribed custom molded orthotics and over-the-counter devices can be effective. Proper fitting and supporting shoe gear is critical is alleviating heel pain. Many times we place our patients in athletic shoes for prolonged periods. These styles allow more support to the arch and heel, creating a favorable environment for recovery. Do not use flats while trying to recover from plantar fasciitis. In severe cases of heel pain, we ask our patient to take time off work to rest their foot. This is especially true for people who spend a great deal of time on their feet. This may be combined with immobilization in a short leg cast. Surgery maybe needed for those cases of plantar fasciitis which have failed all forms of conservative treatment. There are many different forms of surgery for plantar fasciitis, each of our podiatric physicians has his preferred method. I prefer to perform the EPF (endoscopic plantar fasciectomy) procedure. This procedure has a good success rate which has been proven in the medical literature. It is, however, not without some risks. Calcaneal-cuboid joint syndrome is a possible complication with any surgery where the plantar fascia is transected. Although rare, it does occur. “Walter Strash has a solution for his patients suffering from heel spurs that is best described as shocking. 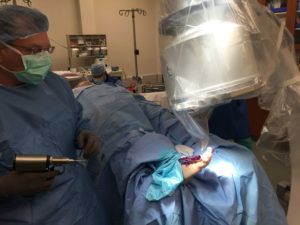 That’s because Strash is utilizing a state-of-the-art, non-invasive treatment for the heel condition that sends an electrical charge into the heel to remove the spur. The method has previously been used to treat kidney stones…Strash went to Atlanta to undergo training in the procedure, and in January 2001 began to offer it to his San Antonio patients. “We’ve treated approximately 48 patients in the past seven months,” he says. “We have found one-third of the patients have 90 percent or greater rehabilitation between a three- to 12-week period.” Full story here. This technology represents the latest innovation in the treatment of resistant plantar fasciitis. We have been utilizing this modality since January of 2000 with excellent results. It is performed in our podiatric office and does not require time off of work. Extracorporeal shock wave therapy (ESWT) is a modern and highly effective treatment method: high-energy sound waves are introduced into the painful areas of the body. With this podiatric innovative treatment, pathological alterations of tendons, ligaments, capsules, muscles and bones can be eliminated systematically. This technology is especially useful for treating plantar fasciitis. The beneficial effects of shock wave therapy are often experienced after only 1 or 2 sessions. The therapy eliminates pain and restores full mobility, thus improving your quality of life. For some time now we have been treating our patients with one of the most innovative shock wave therapy systems – with great success. Shock waves are audible high-energy sound waves. They occur in the atmosphere, for example during lightning strikes, or when airplanes break through the sound barrier. In the medical world, shock waves have been employed since around 1980 to disintegrate kidney stones, for instance. In modern pain therapy, shock wave energy is conducted from the place of its generation– the shock wave generator – to the painful body regions, where it unfolds its healing capacities. How do shock waves work? Shock waves accelerate the healing process by activating the body’s self-healing powers. They stimulate the metabolism and enhance the blood circulation. Damaged tissue gradually regenerates and eventually heals. Which disorders can be treated? The podiatrist localizes the pain region by palpation or shock wave localization and discusses the findings with you. A skin gel is then applied to the treatment area to allow the shock waves to be introduced into the body almost painlessly and without any loss of energy. After these preparations, shock waves are released as the shock wave applicator is moved over the pain region in a circular motion. Duration and frequency of the therapy The therapy session takes between 5 and 10 minutes depending on the disorder to be treated. In general, an average of 2 to 3 therapy sessions are necessary at weekly intervals. Extracorporeal shock wave therapy is offered on a fee for service basis and is not covered by insurance. Dr. Strash was the first podiatrist in San Antonio to use this treatment for plantar fasciitis and was instrumental in bringing Extra Corporeal Shockwave Treatment to San Antonio in 2001. 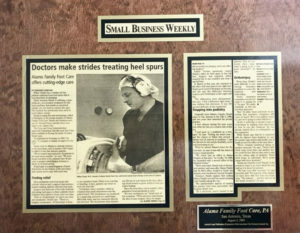 The San Antonio Business Journal published an article about him in August 2001 entitled “Doctors Make Strides Treating Heel Spurs, Alamo Family Foot Care Offers Cutting-Edge Care“. Dr. Strash has lectured and published medical articles on this topic along with teaching other physicians in it’s use… “Strash is ushering in greater usage of Orthotripsy by training other physicians in how to use the Ossatron. 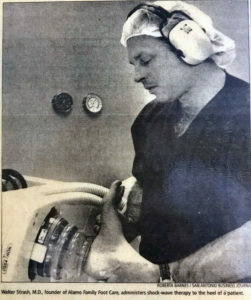 He has already trained 20 or so orthopedists on the equipment.” Read the entire article here. If you answer Yes to one of these questions below, you should talk to us! Chronic pain seriously affects our private and working life as well as our physical fitness. Do you experience pain or stiffness in your feet when you wake up? Do you have problems performing athletics because your feet hurt? Does your Achilles tendon swell or throb after prolonged activities? Do your feet ache or burn after long periods of standing? Do you suffer from severe muscle tension in your calves? Do you experience pain in the Achilles tendon, hell or knee when having to walk or climbing stairs? Charcot foot can occur in a diabetic who has neuropathy (nerve damage) in the foot that impairs the ability to feel pain. Charot foot typically occurs following a minor injury, such as a sprain or stress fracture. The prevalence of Charcotarthropathy ranges from 0.1% to as high as 13%. In patients with diabetes, the incidence of acute Charcot arthropathyof the foot and ankle ranges from 0.15-2.5%. Epidemiologic studies do not distinguish between acute and postacute disease. Bilateral disease occurs in less than 10% of patients. Recurrence of disease occurs in less than 5% of patients. Some studies indicate that men and women are equally affected, while others report a 3:1 predilection for males. Because the patient doesn’t feel the injury, he or she continues to walk, making the injury worse. Bones fracture, joints collapse and the foot becomes swollen, red and deformed. The patient continues to walk on the deformed foot because they do not feel any pain. The continued abnormal forces on the deformed foot result in serious ulcerations which can require amputation. As the disorder progresses, the joints collapse and the foot takes on an abnormal shape, such as a rocker-bottom appearance. 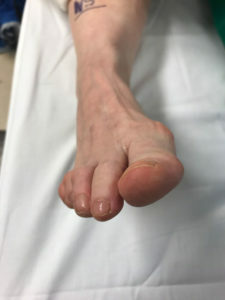 Charcot foot is a very serious condition that can lead to severe deformity, disability, and even amputation. Because of its seriousness, it is important that patients with diabetes—a disease often associated with neuropathy—take preventive measures and seek immediate care if signs or symptoms appear. The obesity epidemic is increasing the incidence of Charcot foot. The excess weight increases the risk of developing diabetes. Once the patients has diabetes, nerve damage to the feet can result. Nerve damage combined with obesity can then lead to micro trauma on the bones which in turn causes Charcot joint to develop. San Antonio has one of the highest incidence of diabetes and obsesity in the country. Podiatrist in San Antonio are all to familiar with the common presentation of Charcot foot to their office. The goal of podiatric Charcot foot treatment is to stabilize the joint. In patients with diabetes avoiding placing weight on the foot for at least 8 weeks may help to prevent further damage. During this time, a total contact or walking cast and crutches may be required to protect the foot. 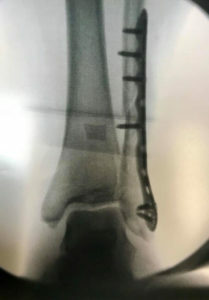 Traditional surgical techniques, in which bones are held in place by internal plates and screws, don’t work with a subset of obese Charcot patients. Their bones, already weakened by complications of Charcot foot, could collapse under the patient’s heavy weight. A common podiatric treatment in such cases is to place the patient in a fiberglass cast. But bones can heal in deformed positions. And, it is difficult or impossible for obese patients to walk on one leg when the other leg is in a cast. Patients typically have to use wheelchairs and are confined to the first story of the house for as long as nine months. And after the cast comes off, they must wear a cumbersome leg brace. Posterior tibial tendonitis is an inflammation of the posterior tibial tendon and its sheath. It extends from the inside of the ankle to the arch of the foot. Tendons are fibrous cords that connect muscles to bones. The posterior tibialis tendon helps maintain the arch of the foot and is used to turn the foot in (the medical term for this is “inversion”) and to help flex it (plantar flexion). Injury to this tendon can result in loss of function, primarily affecting push off from the ground with walking and running. Pronation, which is walking on the inner aspect of the foot. Walking this way alters the normal forces in the feet—the arch flattens and the foot turns outward. To compensate, the muscles work harder and become tired. This may lead to chronic inflammation of the tendon. Long term, it can cause the tendon to deteriorate, lengthen, and even completely rupture. If that happens, the foot flattens. This condition is called flatfoot deformity. Aging. With age, the posterior tibial muscle and tendon may become weaker and cause flattening of the arch. This puts further stress on the tendon. Other foot conditions may contribute to loss of the arch over time. Chronic inflammation, which is associated with rheumatoid arthritis or other arthritic conditions. The podiatrist will ask about your symptoms and medical history, and perform a physical exam, paying special attention to the foot. Posterior tibialis tendonitis can be difficult to diagnose because pain in the ankle and foot can be due to many causes. The doctor will try to feel the tendon through your skin and note how the foot moves and handles resistance to moving the foot inwards. He or she will look at the foot from behind and from the side and see how flat the arch is. The podiatrist may also ask you to try to stand on the ball of your foot. If you cannot do this you are likely to have a problem with your posterior tibial tendon. You may be referred to an podiatrist. Early treatment and correction of the underlying cause improves the prognosis. Custom-made orthotics—These are shoe inserts that can decrease tension on the tendon, reduce pronation, and help support the foot. If you notice you are walking on the inner aspect of your foot, consult a doctor. If you have a foot or ankle injury, get medical care. Obtain proper training for sports and dance activities. The peroneal tendons consist of two tendon that arise from the muscles on the outside of the leg just below your knee. The tendons course behind the outside of the fibula(outside ankle bone), then turn and connect to two different areas of the mid foot. One peroneal tendon attaches to the outer part of the mid foot, while the other tendon runs under the foot and attaches near the inside of the arch. The main function of the peroneal tendons is to stabilize the outside of foot and ankle. 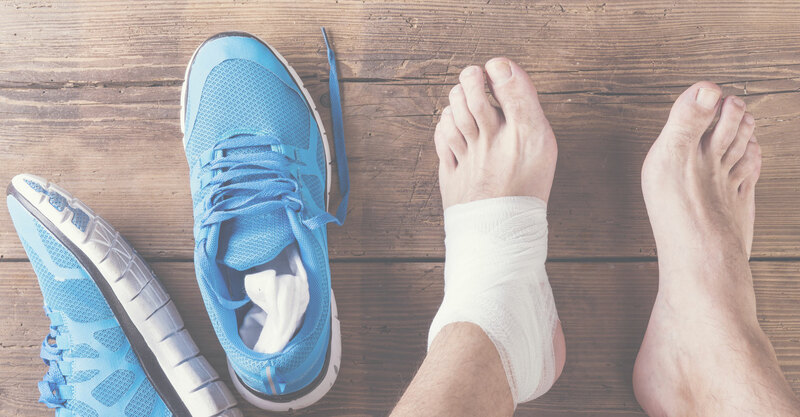 Peroneal tendon problems occur either from repetitive use injuries such as running, tennis, cycling or from a sudden injury such as an ankle sprain or fracture. In the case of repetitive use, patients will usually notice a gradual increase in symptoms to the outside of the ankle which are usually made worse by doing physical activities. Initially, the tendon will become inflamed a condition known as tendonitis. However, if not treated, the tendons generally become scarred and weak and will eventually tear. Being on the edge of the hill country, San Antonio is a hotspot for mountain biking and cycling. Consequently, many of the the sports related peroneal tendon injuries we see as podiatrist are a result of those activities. When you damage the peroneal tendons from an acute injury, it may not be readily apparent as there is generally other injuries which are the primary focus, such as torn ligaments in the case of an ankle sprain. Immobilization: A cast or splint may be used to keep the foot and ankle from moving and allow the injury to heal. Medications: Oral or injected anti-inflammatory drugs may help relieve the pain and inflammation. Physical therapy: Ice, heat, or ultrasound therapy may be used to reduce swelling and pain. As symptoms improve, exercises can be added to strengthen the muscles and improve range of motion and balance. Bracing: The podiatrist may provide a brace to use for a short while or during activities requiring repetitive ankle motion. Bracing may also be an option when a patient is not a candidate for surgery. Surgery: Surgery may be needed to reconstruct the damaged or torn tendons. A tarsal coalition is a bone condition in feet that causes decreased motion or absence of motion in one or more of the joints in the foot. The lack of motion or absence of motion is due to abnormal bone, cartilage or fibrous tissue growth across a joint. When excess bone has grown across a joint there is usually little or no motion in that joint. Cartilage or fibrous tissue growth can restrict motion of the affected joint to varying degrees causing pain in the affected joint or in surrounding joints. Tarsal coalitions can occur outside of a joint as well. This is referred to as a bar. A bar connects two bones that don’t normally touch or have a joint between them. The bar will limit motion in the surrounding joints causing abnormal wear and tear to the joints of the foot. This can lead to early arthritis and pain. The bar itself can be painful as well if it is incomplete, traumatized during walking, sporting activities, or an accident. In the foot, the bones found at the top of the arch, the heel and below the ankle are referred to as the tarsal bones. 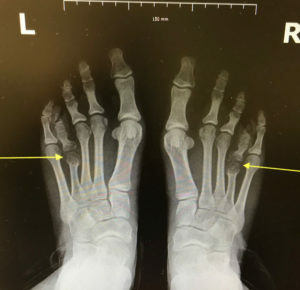 A tarsal coalition is an abnormal connection between two of the tarsal bones in the back of the foot or the arch. 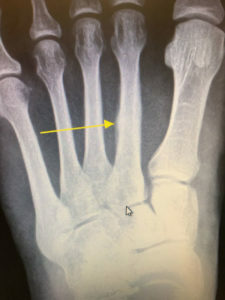 This abnormal connection between two bones is most commonly an inherited trait and passed down from generation to generation. All coalitions are not inherited though. They can also arise from outside sources such as arthritis, infection, trauma and abnormal bone growth. These outside causes are much less frequent. Patients with a painful tarsal coalition commonly describe an aching sensation deep in the foot near the ankle or arch. In many cases, muscle spasms on the outside of the affected leg are present. This a natural reaction of the body as it tries to limit the painful motion occurring in the foot. Patients may notice that the affected foot is not as flexible and appears significantly more flattened when compared to the other foot. This only holds true if only one foot is affected, as it is common for both feet to be affected. All flat-footed people do not have tarsal coalitions though. There are many other causes of flat feet as well. Symptoms most commonly appear in the teenage or early adult years depending on the location of the coalition. It should be noted that not all tarsal coalitions become symptomatic I see many patients that never knew they had a tarsal coalition until it was seen on X-rays taken for other problems. The onset of symptoms may be delayed later into adulthood as well as the joints become more affected with age. Diagnosis of a tarsal coalition can usually be made from symptoms described by the patient to the podiatrist and physical exam findings. X-rays are usually taken and in most cases a CT scan or MRI will confirm the diagnosis and provide valuable information regarding the type of coalition, its location, and how the joints have been affected. There are a variety of methods to treat a tarsal coalition depending on the severity of the condition, the age of the patient, and which joint or bones are effected. Conservative podiatric treatment involves non-surgical options. Conservative treatment is directed toward reducing motion in the affected joint to decrease the pain and muscle spasm. Immobilization in a cast or fracture walker boot can calm down the irritated areas and reduce spasms. Orthotics ( custom shoe inserts) are also commonly used to accomplish this on a long term basis to help prevent recurrence of symptoms. Podiatric physical therapy and anti-inflammatory medication may be utilized as well. Cortisone injections in the affected area may provide relief for an indefinite period of time. These conservative methods of treatment may or may not provide long-term relief. If symptoms persist then surgical correction is often a good option for long term relief. The type of surgery will depend on the type of coalition, its location, how high or low the arch is and the amount of arthritis and joint damage that has been caused in the foot. If caught early the coalition can be removed to restore motion of the foot. Many times patients do not seek treatment until there has been significant joint damage. In these situations surgery may involve fusing the affected affected joint or surrounding joints. This is designed to limit or completely stop the pain and the painful motion of the affected joints. Following a traumatic brain injury equinovarus deformity of the foot is the most common deformity of the lower extremities. Every year about 1.5 million Americans sustain a traumatic brain injury (TBI) and currently about 5.3 million Americans live with disabilities from a TBI. Along with cognitive deficits, the most common physical deformity resulting from hemiplegic TBI or stroke is a spastic equinovarus (SEV) foot. This deformity makes it quite challenging for patients to walk as they are now only able to bear weight on the outside portion of the affected limb. 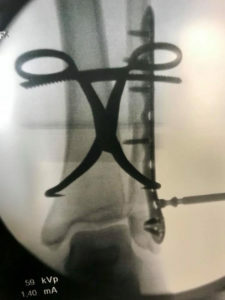 A surgical procedure called the Split Tibilais Tendon Transfer is very successful in correcting the SEV deformity and allowing patients to walk with a more normal gait. Most patients are able to walk brace free after this procedure. Those patient requiring a brace after this surgery will likely require a much less cumbersome brace in the form of a more appealing polypropylene ankle-foot orthosis. Please see the intra-operative photo’s below demonstrating the progression of correction on the operating room table. 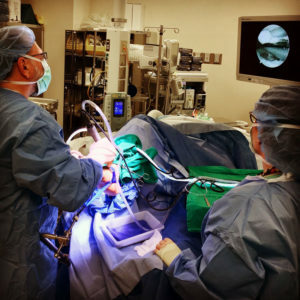 Ankle arthroscopy is a surgical procedure that uses a fiber-optic viewing camera and small surgical tools to operate in and around the ankle joint through small incisions. Ankle arthroscopy can be both diagnostic and therapeutic for a variety of ankle conditions. Your foot and ankle surgeon may recommend ankle arthroscopy for a variety of conditions. Pain, locking and swelling of the ankle joint due to loose bodies is a very common condition. This is known as an Osteochondral defect (OCD) of the ankle. Usually these are areas of damaged cartilage and bone in the ankle joint. OCDs are usually caused by injuries to the ankle such as fractures and sprains. Many patients that have suffered an ankle sprain will have deep pain within the ankle joint with walking and running activities. These patients may go many months hoping their ankle will get better but it simply does not improve. Once evaluated, your foot and ankle surgeon may recommend a MRI and then arthroscopy of the ankle to remove the loose bodies and perform subchondral drilling. Recovery for this procedure requires wearing a fracture boot, use of crutches for three to four weeks, followed by temporary use of an ankle brace while increasing activity and possible physical therapy. 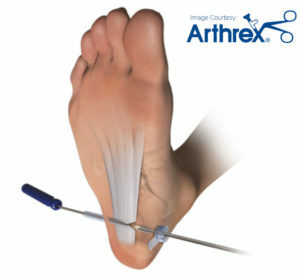 Ankle arthroscopy is used to evaluate and treat a variety of pathologies within the ankle joint including confirming a diagnosis, removing loose boney bodies, shaving bone spurs, debriding excess inflamed synovial (ankle joint) tissue, and fixing fractures of the joint surface within the ankle. If you are having longstanding ankle pain that ‘is just not getting better’, ask Dr. Strash. High ankle sprains or syndesmotic injuries are common and can be crippling. There’s an ankle sprain about every two minutes in the United States and approximately one in ten will have an injury to the syndesmosis. The ankle syndesmosis is composed of fibrous ligaments uniting the tibia and fibula. This ligament is very important for weight transfer during walking. The syndesmotic ligaments provide stability and allow the fibula to rotate somewhat relative to the tibia. These ligaments give strong oppositional force to the fibula providing strong dynamic force to the ankle mortise. How is the injury sustained? Syndesmotic injuries usually result when an external rotation force acts on the foot relative to the tibia. This means the foot is moving outward while the lower leg remains somewhat stationary. It’s possible to have a syndesmotic injury with or without (high ankle sprain) a fracture to the ankle. Your foot and ankle surgeon will perform a history and physical along with obtaining x-rays of your ankle. 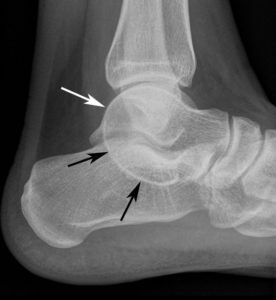 Other studies that may be ordered to aid in detecting syndesmotic injuries include computed tomography (CT), magnetic resonance imaging (MRI) and arthroscopy of the ankle. These advanced studies are usually ordered for patients that have continued or chronic pain and where clinical and radiographic evaluations are not definitive. What’s the purpose? The goal when treating syndesmotic injuries of the ankle is the reduction and maintenance of proper alignment of the ankle joint. 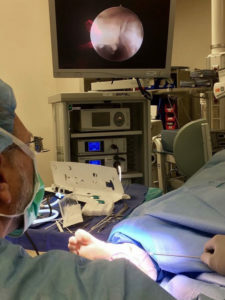 This is accomplished with surgery requiring fixation of the syndesmotic ligament with either metal or absorbable screws (no need for removal) or a type of strong suture repair with FibreWire (see animated video below). The FibreWire repair provides semi-rigid dynamic repair and there is no need to remove hardware and undergo a second surgery. Post-operative recovery is surgeon dependent, however most patients will remain nonweightbearing with a cast and crutches until boney healing of the ankle fracture is achieved. If you’ve suffered an ankle injury and continue with pain, further evaluation and treatment are necessary. 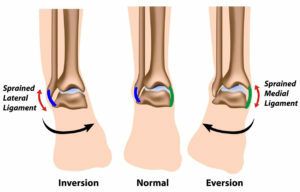 The most common type of ankle sprain is an inversion injury where the ankle “rolls over”. This is due to the anatomy and biomechanics of the ankle as the ligaments on the inside of the ankle are stronger causing the ankle to roll out and our foot to roll under. During this motion a “pop” is sometimes heard possibly indicating one or more of the lateral ankle ligaments have been torn (or possibly suffering an ankle fracture). Unfortunately, once you sustain an ankle sprain they commonly come back. If the lateral ankle ligaments are stretched or torn, the ankle becomes loose and unstable. Ankle sprain symptoms vary depending on severity. Often, the ankle is tender, swollen, and discolored (bruised). The ankle can be quite painful to touch and with movement. Walking is usually hampered and may become difficult depending on the severity of the sprain. 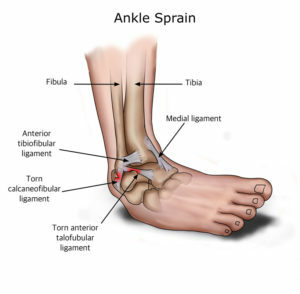 A feeling of instability may occur, especially in severe ankle sprains when ligaments are torn. Most ankle sprains need only a period of protection to heal. The healing process takes about four to six weeks. Even a complete ligament tear to one of the ligaments can heal without surgical repair if it is immobilized appropriately. OUCH! I think I sprained my ankle? With an initial injury, use R.I.C.E (rest, ice, compression and elevation): Rest: your ankle by not walking on it. Ice: should be immediately applied. It keeps the swelling down. It can be used for 20 to 30 minutes, three or four times a day. Combine ice with wrapping to decrease swelling, pain and dysfunction. Compression: bandages or ace-wraps immobilize and support the injured ankle. Elevate: your ankle above your heart level for 48 hours. If you’ve suffered an ankle sprain and your pain persists it’s advisable to seek medical attention from your foot and ankle specialist. Your podiatrist will perform a physical exam (test your ankle stability), evaluate your ankle x-rays and depending on the circumstances send you for an MRI. It is important not to neglect treatment of an ankle sprain as this could lead to chronic instability of your ankle joint and damage to your ankle joint. It may even cause foot, ankle or knee pain. At Strash Foot and Ankle Care we offer a variety of treatment options aimed at relieving your foot and ankle ailments. 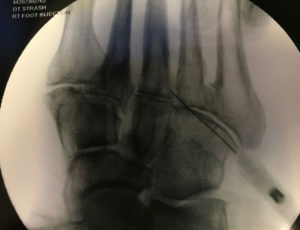 If conservative treatment fails, Dr. Strash’s surgical skills and techniques are proven to work, so you can continue dancing, running and allowing your feet and ankles to support you for many more miles. If you are a patient suffering from ankle sprains, please let Strash Foot and Ankle Care help you get back on your feet by calling our office. The Achilles tendon is the largest tendon in the body and is found on the back of the ankle. Its primary function is to help you lift the back of your heel off the ground as you walk or run. The tendon connects the calf muscles to the back of the heel. 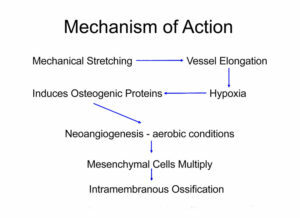 Since we use the tendon with every step, it is subject to repetitive forces. If these forces are abnormal, a repetitive use injury can develop. What is a repetitive use injury? It is a term used to describe an injury which is caused by performing motions over and over. A familiar example is carpal tunnel injury, which occurs from things such as typing and clicking your mouse. In the same way, many Achilles tendon injuries are caused by walking on your feet and having ABNORMAL forces placed on the tendon. What are abnormal forces? One example would be a person who is overweight. Each step is placing forces on the Achilles tendon which are in excess of its capacity. As we abnormally stress the tendon with each step, cumulative damage and degeneration ensues. At first this damage will not necessarily be noticeable, but as time passes the damage accumulates, symptoms will develop. Another example is a person who starts an intense exercise program without properly conditioning the body to work at such stressful levels. The Achilles tendon does not have a good blood supply or the ability to heal itself as effectively as other tendons in out body, so it is more prone to injury from repetitive stresses. Once the injury starts, the body is unable to effectively repair the damage and a chronic degeneration and scarring of the tissue occurs. If left untreated, the tendon will begin to degenerate and scar tissue will form. This is known as Achilles tendonosis. Achilles tendonosis can lead to complete rupture of the Achilles tendon. 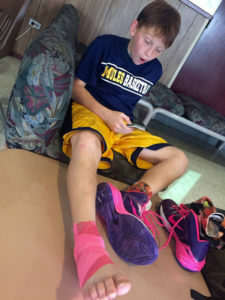 Midsubstance Achilles tendonitis: The “middle” or midsubstance of the Achilles tendon has an inherent lack of good blood circulation which is common to everyone. When this area becomes damaged, it will often form a painful lump right in the middle of the tendon which can eventually tear or rupture. Insertional Achilles tendonitis: The area where the achilles tendon attaches to the heel bone can become inflamed and calcifications can form in this area. Often, these calcifications can grow and a hard painful bump will form on the back of your heel bone. The area is usually warm and painful to the touch. The pain caused by Achilles tendonitis can develop gradually without a history of trauma. If left untreated, Achilles tendonitis can often lead to rupture. Symptoms include pain during exercise, swelling, redness, pain in the pack of the ankle when arising from rest, inability to walk without limping, or a cracking sensation. Squeezing the tendon from side to side can sometimes elicit significant pain. Pain in the back of the ankle when walking or running. Pain is aggravated with increased activities. Squeezing of the tendon causes pain. Swelling and or warmth to the back of the heel. Achilles tendon has a lump or lumps in the back of the ankle. Pain is better when wearing shoes with a heel (high heels or boots) are used. Radiographs, ultrasound and MRI along with a physical signs and symptoms are utilized to diagnose the condition. Prior to initiation of podiatric treatment, it is important to determine the extent of damage to the Achilles tendon. Often times, patients can have mild symptoms and yet have significant degeneration of the tendon. This is why it is critical to seek medical care prior to attempting self treatment. If moderate to severe degeneration has taken place, complete rupture of the Achilles tendon can occur. Non-surgical podiatric treatment of Achilles tendonitis is aimed at rest, stretching and improving range of motion. This is usually accomplished medication with icing, stretching, lifts, orthosis, physical therapy, cast immobilization, topical or oral anti-inflammatory medications and extra corporeal shockwave treatment. Early stage Achilles tendonitis can usually be treated successfully without surgery. Rest: Stopping or modifying whatever high impact activity you are doing can rest the tendon and eliminate abnormal forces. For example, if you are a runner, switching to biking or using an elliptical trainer can help. Immobilization: Often times, the extremity will need to be place in a CAM-boot or cast. If there is significant disease, the patient maybe placed in plantarflexed non-weight bearing below the knee cast. Stretching: Simple stretching exercises done DAILY can help decrease the abnormal forces on the tendon. Heel lift: Using a small heel lift in your shoe can put some “slack” in the tendon, giving it a change to rest. Icing: Apply ice to the area 10-15 minutes, two times per day. 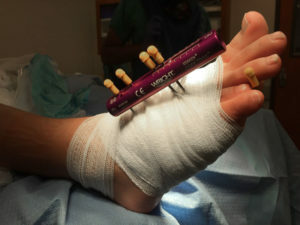 Extra corporeal shock wave therapy (ESWT): This podiatric technique breaks up the scar tissue that has formed in the tendon and helps increase circulation to the area facilitating the natural healing process. If non-surgical treatment fails to provide adequate pain relief, surgery may be needed. 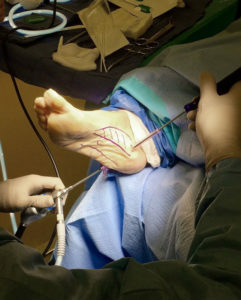 Generally, podiatric surgery involves removal of the diseased portions of the tendon. Biological membranes maybe applied to augment the repair. Also, transfer of tendons from the foot to the ankle are sometimes needed when there is severe degeneration of the Achilles tendon. These surgeries typically are quite extensive and have a prolonged recovery. Fortunately, most cases of Achilles tendonitis do not require surgical management. San Antonio, TX has a temperate climate. As a result outdoor sports and activities are popular throughout the year. Sports such as Golf, football and soccer are played year round. Consequently, as podiatrist, we see Achilles tendon injuries throughout the year with a slight up tick in spring and summer. To understand an ankle fracture, first we must define which bones make of the ankle joint. The tibia. This is the largest bone of your leg and is also know as your shin bone. The tibia’s lower end curves around the inside of you ankle to become a structure called the medial malleolus, which you can feel at the inside of your ankle. The fibula. This is the thinner of the two bones of the lower leg. It starts just below your knee and course down the outside of your leg to bone a structure called the lateral malleolus, which you can feel on the outside of your ankle. The talus. This is a wedge-shaped bone that is located deep inside the ankle, located between the heel bone and the ends of the tibia and fibula. The talus supports the lower ends of the tibia and fibula. You generally cannot feel this bone as it is deep in the ankle. There are many ways to fracture an ankle bone, the most common injuries involve a sudden sharp twist of the ankle. Ankle fractures are common injuries among people of all ages, interests and lifestyles. People involved in a wide range of athletic activities, including basketball players, snowboarders, soccer players and football players are at high risk of ankle fractures because of the physical demands placed on their ankles. Ankle fractures also occur during slips on icy pavement, falls from a high place, or direct impacts to the ankle during a car crash or motorcycle accident. High-impact ankle injuries are especially dangerous if the bone pokes through the skin and is exposed to the environment as this can allow the area to become contaminated and lead to an increased chance of infection. A thorough podiatric history and physical examination along with x-rays of the injured ankle are generally used to make the diagnosis and determination if surgical management is necessary. Arthritis is a disease characterized by inflammation, deterioration and eventual loss of cartilage in the joints of the foot. Cartilage allows for fluid and smooth motion of joints. When cartilage breaks down or is lost, symptoms such as inflammation and limited mobility develop. Inflammation causes redness, warmth, pain and swelling. There are about 40 million Americans who suffer from arthritis. The National Institute of Arthritis and Musculoskeletal and Skin Diseases, estimates that by the year 2020, about 60 million Americans will have arthritis. There are many different types of arthritis. The most common type is called osteoarthritis. It is known as a wear and tear arthritis and it usually develops as part of the aging process. Osteoarthritis causes a slow and gradual wearing away of cartilage in the joints of the foot. Over time, movement becomes difficult and painful. The pain and swelling worsens while standing or walking. Stiffness usually occurs after periods of rest. Rheumatoid arthritis (RA) is a chronic, systemic inflammatory disorder that may affect many tissues and organs, but principally attacks the lining of our joints, also known as the synovium. The process causes a swelling and thickening of this lining. 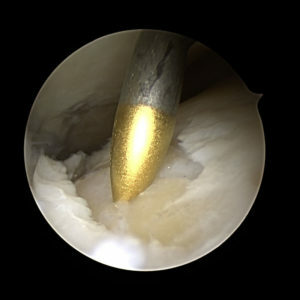 The disease process often leads to the destruction of articular cartilage, dislocation and stiffness of the joints. Although the cause of rheumatoid arthritis is unknown, disorders of our immune system play a pivotal role in both its chronicity and progression. Gout is a type of arthritis. It can cause an attack of sudden burning pain, stiffness, a swelling in a joint, usually a big toe. These attacks can happen over and over unless gout is treated. Over time, they can harm your joints, tendons, and other tissues. Excess uric acid crystals collect in and around the joints of the big toe. This often leads to severe and sudden pain. Gout is more common in men. To help improve mobility and decrease pain and swelling sometimes medications, bracing, orthosis, steriod injections, custom shoe gear and physical therapy can be utilized. 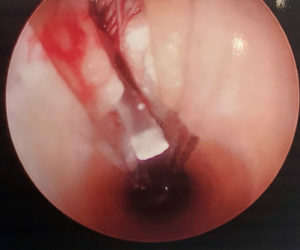 When conservative treatment does not provide the patient with relief, a wide variety of surgical techniques can be utilized to improve daily symptoms. Distraction of joints is very common in the management of an arthritic ankle by European surgeons. The arthrodiastasis procedure is indicated as an alternative to fusion or joint replacement in the younger population. 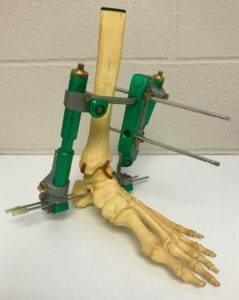 An external fixator is applied to the distal portion of the leg and foot for approximately 12 weeks, followed by a period of physical therapy. Here in San Antonio, we were among the first podiatrist to offer this novel treatment. When conservative treatment has been exhausted and you hear your surgeon say, “We’re going to have to operate” there’s no doubt a shiver is felt down your spine. Questions in regards to the type of surgery, post-operative recovery and prognosis follow and of course how badly the surgery is going to hurt. This is where an injectable medication called Exparel can help. Exparel is a local anesthetic injected into surgical sites. 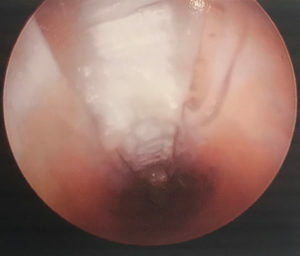 It is a bupivacaine liposome injectable suspension and will turn off the body’s pain signals to an area giving patients several days of numbness and pain relief at the surgical site. 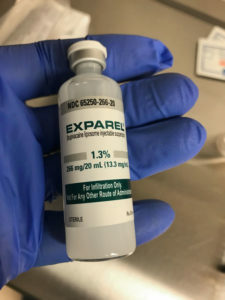 Most local anesthetics can give patients four to six hours of pain relief but Exparel works way beyond this short time frame and will get patients through the acute pain period offering pain relief for three to four days. Another great benefit of this medication is that the prolonged pain relief reduces and in many cases eliminates the need for opioid use. This is of particular benefit for patients who are at risk of adverse events using opioids and also reduces the risk of abuse and dependency. Unfortunately many surgeons do not sufficiently treat post-operative pain. Patients are most commonly prescribed pain medication that lasts four to six hours and if they are having pain they are told to “double up” on their oral pain medication. This is clearly inadequate. Dr. Strash uses Exparel routinely on all of his surgical patients. He has noted that most of his patients take little or no opioid medications after surgery and as a result his patients have a much more pleasant and pain-free post-operative experience. When you schedule surgery with Dr. Strash be sure to ask him about Exparel. Have you had foot and ankle surgery but continue with pain? When visiting your foot and ankle specialist with continued symptoms after surgery, he or she will perform a history and physical exam along with ordering x-rays. Your foot and ankle surgeon may also order a CT scan or MRI depending on your presenting symptoms and history. 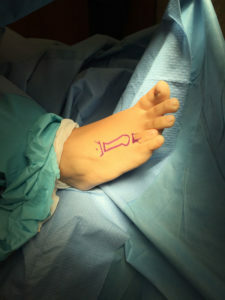 When revising a prior foot and ankle surgery there are several goals your surgeon will keep in mind including but not limited to: establishing a plantigrade foot, correcting malalignment (malunion) of the foot/ankle, ‘best’ procedure choice when revising a deformity not adequately addressed, soft tissue coverage and ensuring bone healing if treating a delayed or nonunion. 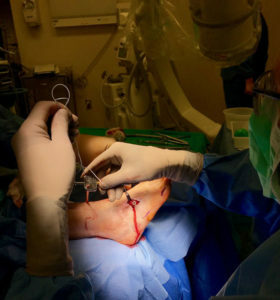 Successful reconstruction of failed foot and ankle surgery begins with proper evaluation, listening to patient complaints, understanding of the initial deformity and prior procedure that was performed, biomechanics and the experience of the foot and ankle surgeon who may perform the surgical revision. 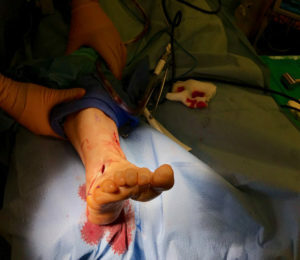 Be sure to check and see if your podiatric foot and ankle surgeon is board certified in Reconstructive Rearfoot/Ankle Surgery by the American Board of Foot and Ankle Surgery (www.abfas.org/).